Well this post brings the Christmas Cards from my 'stuff' to a close. 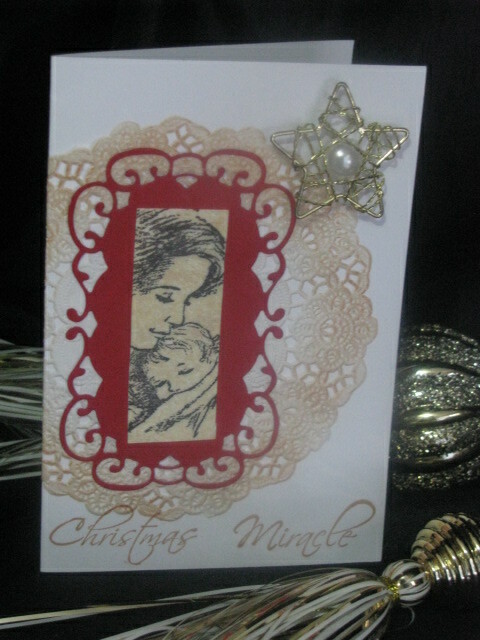 It will be a mix of cards but all are Christmas Cards. I have more 'stuff' but I will pack the majority of these off to my friend Heather, in Nagambie, Victoria. If there are any local stampers who would love to help Heather make these or other cards for charity, then send me an email and I will pass on your contact details. I am sure she would appreciate the assistance and while you are at it, you both will have a blast stamping with a new buddy! The base card had the Christmas Village from PSX stamped on it and stippled with dye inks for a soft placement of colour in the background. I used the negative scrap which had a Marianne frame cut out of it leaving a lovely frame in itself. I placed a green border along the top and bottom again from my scrap pile. 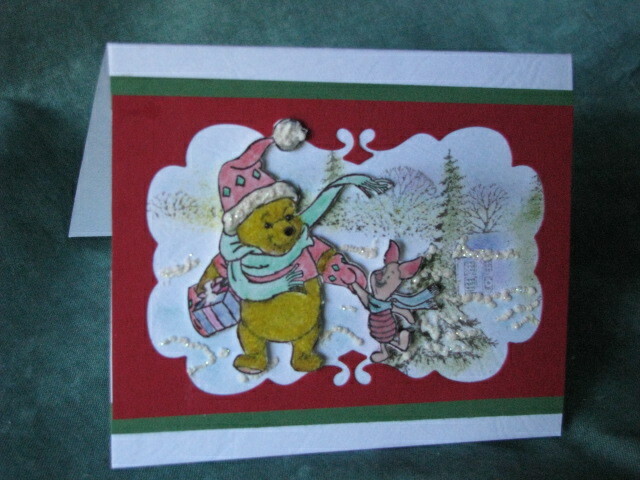 The stamp is of Winnie the Pooh and Piglet out on the town getting presents.They were stamped, embossed and water coloured, I popped Pooh and Piglet out on foam tape. Pooh's hat and snow have white liquid applique features. pooh's body has also been flocked. 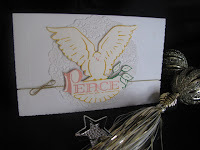 The Peace Dove was a very old image back from when I used to use my Print Gocco which has to be more than 10 or maybe even 15 years ago. (I told you I had been keeping stuff for a very long time!). It was already cut and so I just added a white doiley on a card base. I then snipped the edges about 3cm with half of a diamond hole punch to keep the gold cord which I wrapped around the card front and tied into a simple bow. The notches hold the cord in place without the aid of glue or tape which would be impossible to secure without being visible somewhere. I just hate exposed glue or tape on a card! 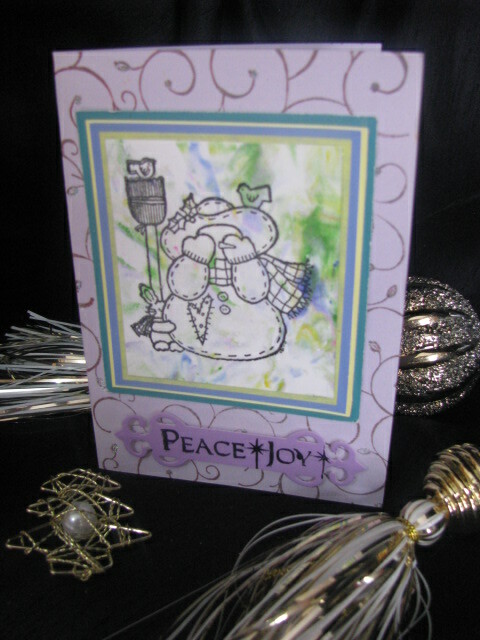 The snowman was stamped and embossed on a shaving cream marbled paper. (Google it, if you want to learn how to do it. It is a great technique that both adults and children thoroughly enjoy. PS: Just use food dye to keep the cost down rather than re-inkers!) The base lilac card was stamped in a curlicue design (Stamp It (Aust) image) using Adirondack's Slate ink pad. The tiny leaves and flower tips were touched with Quickie glue and some clear ultra fine glitter. The Spellbinder label was punched out of paint chip board and stamped with part of a greeting - unknown source. 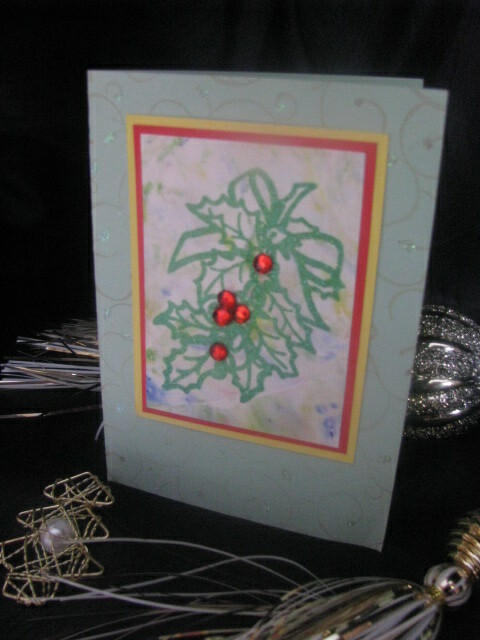 The Holly was stamped and embossed on a shaving cream marbled paper similar to the snowman above but using a green embossing powder. Red diamantes were adhered as holly berries from my stash. The layers being the marbled paper are from paint chip board and the base card was also stamped in the same curlicue design (Stamp It (Aust) image) but in Lime Green Chalk Ink but after it has been stamped off to remove the first brighter ink colouring. Well that wraps up my Christmas Stuff for the time being. As I said earlier, I will most likely ship the bulk of the rest of my Christmas stuff and other stuff to Heather soon as promised. Do pop a line in the comments section as it would encourage me that some people are at least reading this little blog of mine. we all need encouragement from time to time. 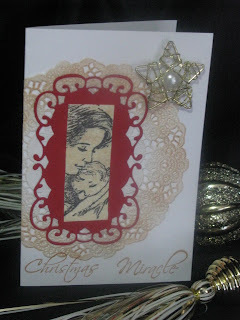 I love that you are cleaning out stuff.....I have been too.....www.quillingbysandrawhite.com. Check out my website when you get a minute to explore.